Supermarket group Morrisons has sold 114 Safeway stores and a distribution centre to rival Somerfield in a £260m ($475m) deal. The stores being sold are the smaller Safeway compact stores, and all will now become Somerfield outlets. Sixty-three of the stores are being sold directly to Somerfield for £115m. The remaining stores and the distribution centre are being sold to a Barclays Bank joint venture which will then lease them to Somerfield. Morrisons took over Safeway in March this year, but sales at the Safeway stores have proved a drag on the group's performance. Last week, Morrisons unveiled a 7.6% drop in half-year profits to £121.6m, with sales at stores still carrying the Safeway brand down 7.9%. 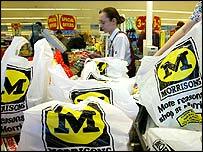 Morrisons is set to accelerate its rebranding programme, and plans to have all stores under the Morrisons badge by the end of 2005. "This disposal will allow us to concentrate on our area of expertise of running larger stores, and will help us to speed up the conversion process," said Morrison's joint managing director Bob Stott. "The sale of these... stores means that we will be able to re-engineer our supporting infrastructure and achieve a much greater level of efficiency across our entire supply chain." Somerfield's acquisition of the Safeway compact stores strengthens its presence in the increasingly-competitive convenience store sector. "This acquisition represents an excellent opportunity for Somerfield to grow its estate without a significant increase in gearing, and to capitalise on its proven expertise in operating smaller stores," said chief executive Steve Back. As it unveiled the deal, Somerfield also gave an update on its latest trading. Like-for-like sales - which strip out the effects of store openings and closures - were up 1.4% at Somerfield stores, and rose by 0.2% at Kwik Save outlets in the eight weeks to 9 October. Group like-for-like sales were up 1.1% for the 24 weeks to 9 October. Somerfield said the figures were in line with expectations, but added that "market conditions remain tough".